Is this the new face of Texas Longhorn football? No, no it is not. Jose Conseco thinks he would be a good fit for Texas. Forget Nick Saban. 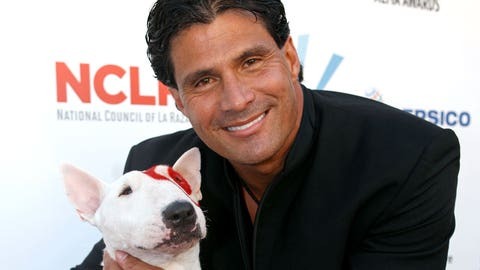 Jose Canseco has a better idea for who should take over at Texas — himself. The former major league slugger embarked on one of his trademark Twitter rants Sunday morning, this one centering around his desire to replace Mack Brown as head coach of the Longhorns. In a flurry of tweets sent within a three-minute span, Canseco bashed Texas’ poor line play, its short, noodle-armed quarterbacks, and Big 12 rival Baylor’s recent tendency of luring some of the state’s top recruits away from Austin. All of this, Canseco says, would change with him at the helm. Canseco may not be the answer — OK, he’s definitely not the answer — but few can argue that Texas has fallen from its usual glory in recent years. The Longhorns have not posted a 10-win campaign since losing the national championship to Saban’s Alabama squad following the 2009 season, their longest drought since the late 1990s. Check out Canseco’s unofficial job application in the tweets below. Hey Steve @stevepatterson you need a huge name for huge job buddy. I know football even better than baseball. Side note: Canseco appears to be tweeting at Texas athletic director Steve Patterson, but we’re fairly certain he is not using the correct handle. This particular Patterson only has 11 followers and has sent just one tweet, way back in April 2008. Hey Steve @stevepatterson Here is my plan to fix Texas football.